My favorite movie and book of all-time are both Jurassic Park, so I was pretty pumped for the release of Jurassic World: Fallen Kingdom this summer. I knew there would be many raptor aficionados who would be falling in love with the sole remaining member of Chris Pratt’s raptor squad once again after the movie hit, so I planned on making some raptors inspired by Blue in time for the holidays. But to my surprise, one big Blue fan couldn’t wait, and commissioned her own poseable Blue Raptor plush doll this summer! 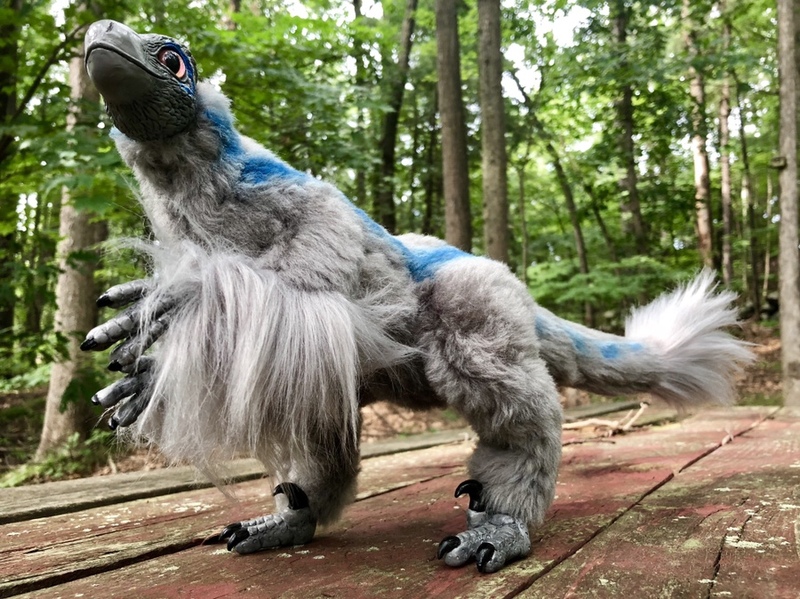 While the poseable raptor art doll is one of my oldest and most popular patterns, I’ve primarily themed the raptor plush that I’ve created over the last few years after birds such as blue jays, cardinals and cockatiels. Since dinosaurs have been revealed to have a lot of bird-like traits, it only seemed appropriate. 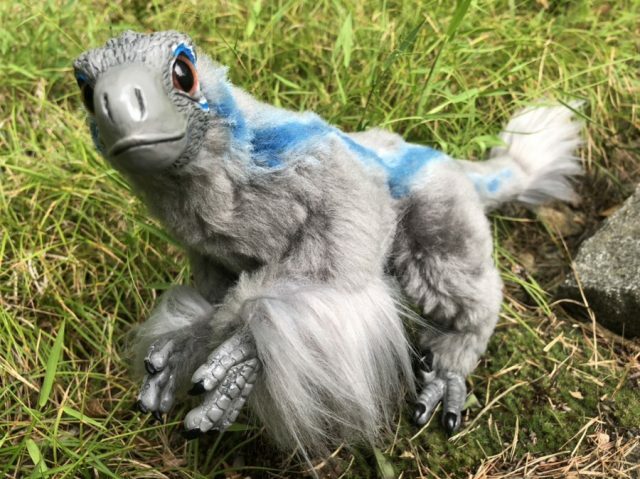 Rarely have I crafted a raptor that just looks like, well… a raptor… by that’s just what I did when creating this Blue Raptor inspired by the Jurassic World character! 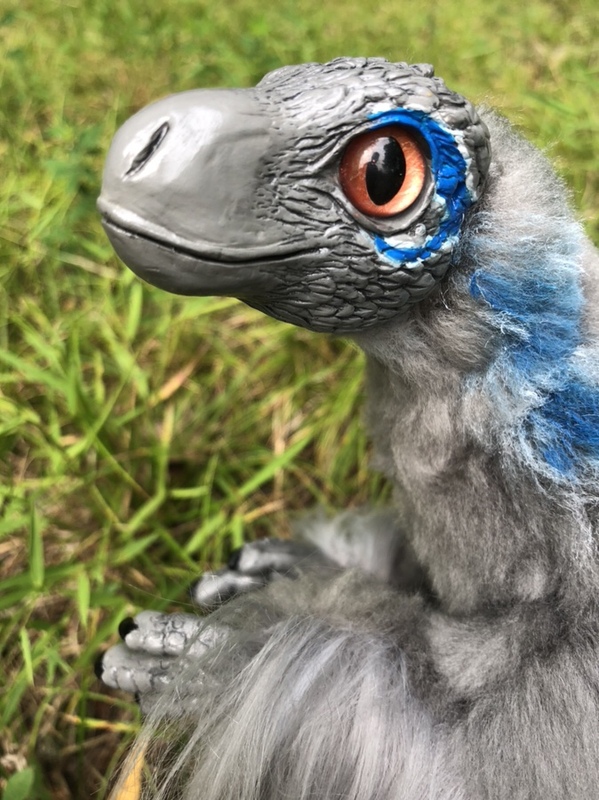 Rather than making a new pattern for Blue to make her look more like the Hollywood interpretation of what a velociraptor should look like, I carried over Blue’s grey body color and blue markings to my more scientifically-accurate, traditional raptor pattern. She features custom dyed fur, swirls of iridescence in her copper colored eyes, and no poofy head crest like my raptors usually have. 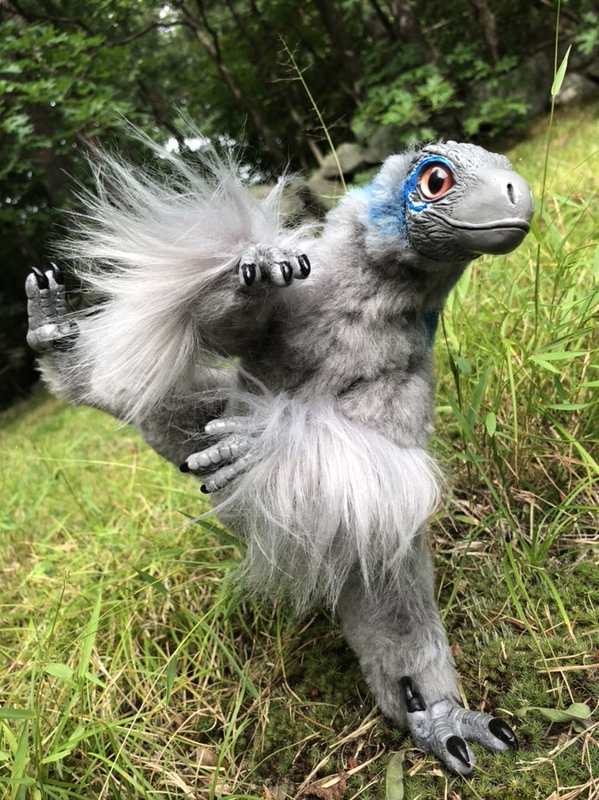 Ultimately, I think that this art doll plush makes a good compromise between being in the realistic style of dinosaurs I prefer, while also featuring the appropriate colors and markings to be reminiscent of the beloved velociraptor Blue from the Jurassic World series of movies. I probably won’t keep this style stocked regularly in my shop, but I’m always open to making one by request for fellow Jurassic Park fans everywhere!